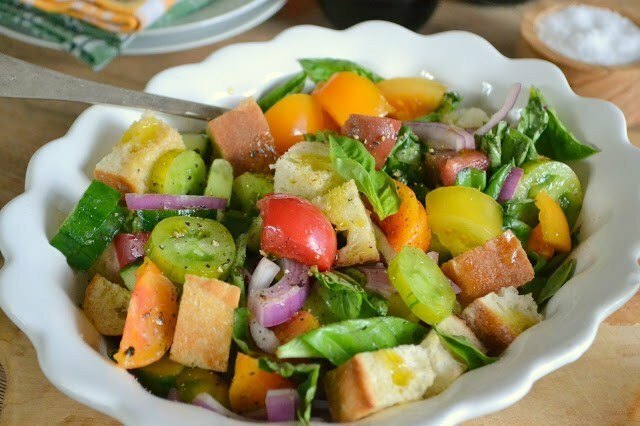 Panzanella Salad is a classic Tuscan tomato and bread salad that is the perfect way to showcase ripe colorful produce and a fabulous oil and vinegar. Put the bread on an ungreased baking sheet and toast in the oven for about 5 to 7 minutes. Rub the inside of your serving bowl with the cut sides of the garlic. Discard the garlic. Put the tomatoes, cucumber, onions and basil leaves in the bowl. Add the cubes of bread. Mix a simple vinaigrette with the oil and vinegar. Taste it and adjust it to suit you. Stir vigorously with a spoon, and then drizzle over the salad Toss well. Let the salad sit for about 15-30 minutes and then serve it up!